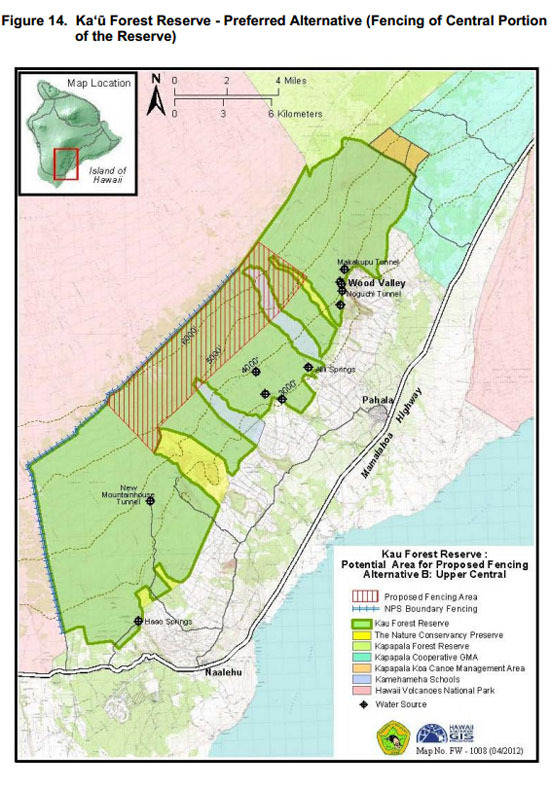 The Department of Land and Natural Resources Division of Forestry and Wildlife (DOFAW) is seeking public comment on a Draft Environmental Assessment (DEA) for a management plan for the 61,641-acre Ka‘u Forest Reserve. As part of the public review process and environmental compliance under Hawaii Revised Statute 343, the DEA is now available for review and comment until June 22. 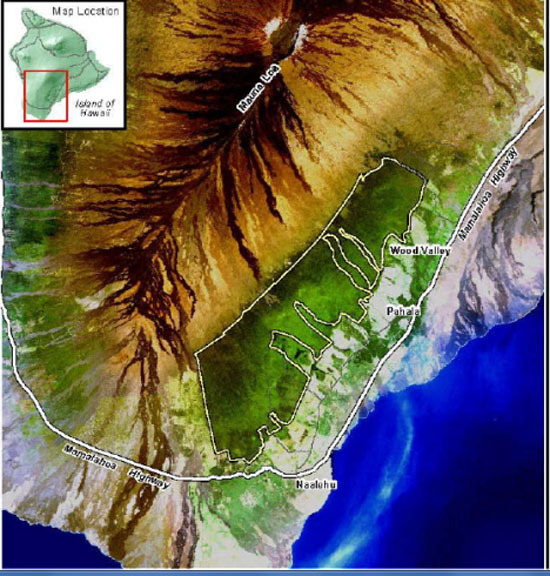 “This management plan is part of the DLNR’s goal to increase protection of Hawaii’s forested watersheds, as well as to fulfill our mandate to restore native Hawaiian species such as the alala and provide access and recreational opportunities to the people of Hawaii,” said William J. Aila, Jr., DLNR Chairperson. The management plan responds to a need to maintain and restore a key watershed in the areas of Wood Valley, Pahala, Waiohinu and Naalehu. It seeks to preserve a unique ecosystem with critically endangered plants and animals, and perpetuate natural resources vital to Hawaiian culture and practices. It may provide a suitable site to reintroduce alala or Hawaiian Crow into the wild, and provide for continued and expanded public use, including hunting. Proposed management actions include enhancing public access in some areas, fencing and ungulate removal from the most critical area(s), predator control to protect native forest birds, invasive plant removal and control, and native plant restoration. The plan also includes actions needed to reintroduce the alala to the Ka‘u Forest Reserve. Nohea Kaawa, DOFAW outreach and education specialist, has been meeting with community members for the past eight months to share information about the Forest Reserve, its status, threats, value to people, and proposed actions to protect it from further damage by invasive, non- native plants and animals. Kaawa said: “A lot of cultural knowledge about the Reserve that has been documented and is still practiced today is the knowledge passed down from our Ka‘u kupuna. We started gathering community input by talking with our kupuna, and from there, everything else fell into place. Shanell Leilani Dedman, a Ka‘u resident, cultural resource specialist, and makua member of Kupuna Council for Hawaii Volcanoes National Park, is supportive of continued and expanded public use. The Ka‘u Forest Reserve was established in 1906 to protect these forests on the lower slopes of Mauna Loa to ensure a good water supply for the agricultural lands of Ka‘u. Tunnels and springs in the Ka‘u Forest Reserve are still used today for domestic use as well as agriculture. Much of the agriculture in Ka‘u, including coffee, macadamia nuts, and ranching, depends on a supply of fresh, clean water from the springs and tunnels in the Reserve, and maintaining this water supply is vital for the future viability of agriculture and the Ka‘u community. The Reserve’s native forests replenish springs and other groundwater, reduce flooding and erosion, provide habitat for unique species of plants and animals and are also a cultural, recreational and scenic resource for the community.